I think I am the first and I will most probably remain in the number one league until this recipe of mine is copied. Hopefully, those who copy have mastered the art of bluffology because rendang definitely is not from India. Of course, Malaysian Indians? Credit my recipe if you are badly want to copy. Actually, come to think of it, nothing much I can do. After all, in the virtual world, there are many loopholes for copying. Boo-hoo-hoo! Alright, let's get down to the business of making Vegetarian Mutton Rendang (Vegetarian Mutton Curry). Remember, we spoke about the vegetarianism theory to vegetarian mutton before (Vegetarian Mutton Varuval & Vegetarian Mutton Peratal)? We sure did. Vegetarian Mutton Rendang? Vegetarian mutton, Malaysian herbs, chillies, coconut milk and turmeric leaf scented. Tadaa! When oil is heated, fry rendang paste till aromatic and oil splits. Add mutton and dried tamarind. Stir and cook till gravy thickens up. Off the heat and combine in sliced turmeric leaf. When I first saw the title of the post you made me laugh. Now I know there is such a thing as Vegetarian Mutton. Ya, you found out that hah!!! I tasted a lot of mock meats before from chicken with skin imitation, to steaks, fish and squid but never tried mutton. Looks really good! 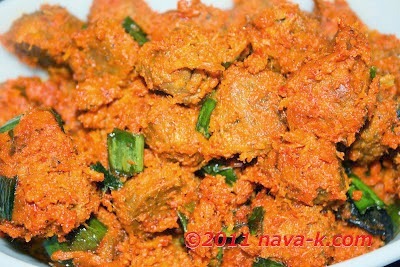 Raymund - you should try this vegetarian mutton, its lovely taste. My auntie loves to cook this dish whenever when vegetarian day for her. Thanks everyone, love all your feedback and do try. I never use Vege-mutton will like to try it you made look delicious and easy to make. Veg Mutton!! This seems to be a very interesting share! !